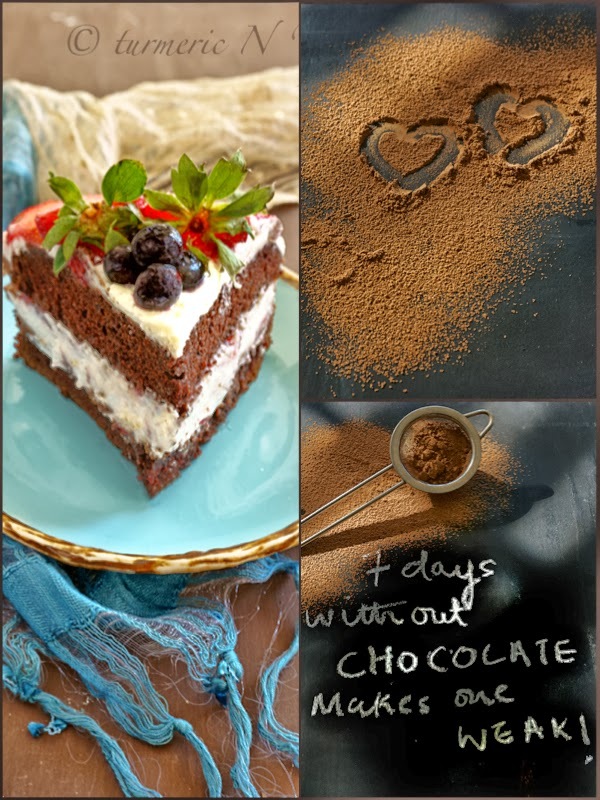 Turmeric n spice: Chocolate, Strawberries and Cream - A Cake ! 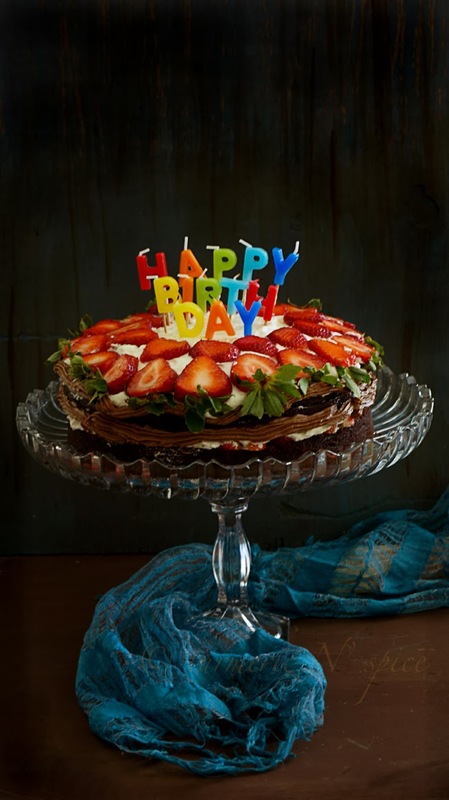 Chocolate, Strawberries and Cream - A Cake ! Last week has gone by rather quickly, it's been a blur. Between shopping, baking and planning a photo shoot for a book cover, everything has moved way to fast. I really am not a shopper, am pretty straight forward with my needs, can't spend hours shopping, specially clothes. On the contrary my mother and sister have a deep passion for it. They need to explore every possibility before they make up their mind, they are phobic about buyer's remorse, which I occasionally suffer from and is more often than not induced by my sister, by questions like ... "did they have that in red?" My solemn response "I did not check" followed by a remorseful grunt and the urge to return the object of purchase. Last week, was spent with 'finally teen', shopping for homecoming. Well, for those of you new to the terminology of homecoming ( like I was just a few weeks ago) here is a wiki definition : "Homecoming is an annual tradition of the United States. People, towns, high schools and colleges come together, usually in late September or early October, to welcome back alumni and former residents. It is built around a central event, such as a banquet and, most often, a game ofAmerican football, or, on occasion, basketball, ice hockey or soccer." To continue the story, she (finally teen) is just like my sister and my mother, both! And a new improved version, like a latest update... with a gusto for trying 10 or 20 or 30 pieces of clothing, before buying 2. Taking a teen shopping for a dress is hard work, it is fun, but after standing like a clothes hanger outside the dressing room for a few hours, you contemplate on your footwear. ( I even took pictures of my aching feet and was tempted to Instagram it) Lesson : don't wear high heals to homecoming shopping. On a serious note, it was a lot of fun, really enjoyed it and the experience will definitely go into the scrap book of our memories. If I could hold on to time, I would do that, right at this moment, it’s slipping out of my hand like sand. Isn’t this a great cake for Valentine’s day ? When I got home, I had a request to bake a cake. 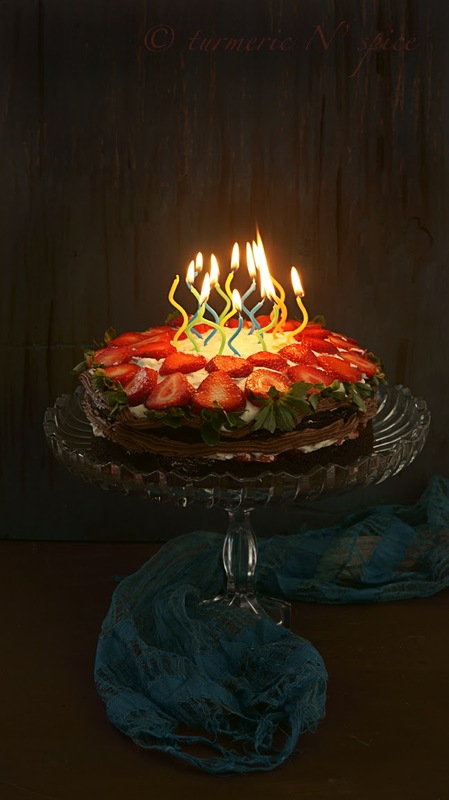 I was looking to bake a birthday cake and was looking for a simple recipe but great looks.. I could not find anything easy. It either needed a degree in the culinary arts or it was just too simple or I did not like the frosting, to cut the long story short did not find anything that I loved. I wanted to enjoy the whole process not stress about it. ( that's another story that I did stress about it). 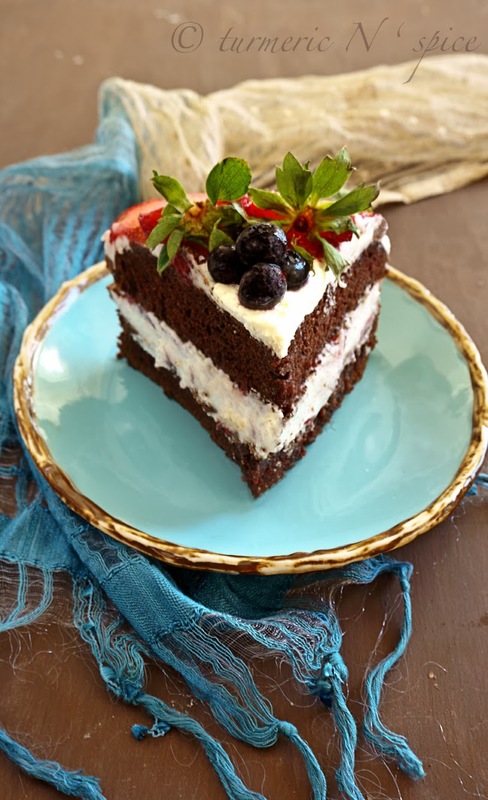 I thought of a simple chocolate cake and planned to dress it up with fruit and cream. You cannot go wrong with chocolate, strawberries and cream. This is an age old combo and just made for each other, sometimes, you look for solutions, when it is right there with you. Why this obsession for cakes this month, it's my third cake/pastry in two weeks. Well, wanted to bake something special for a very special person, who has been a big influence in my life. For the record, the cake was loved! Still learning how to cut perfect cake wedges ! I am sure there is a u-tube tutorial somewhere, for people like us. I almost forgot to share, last week my savory masala cookies got featured on 'Fox New Magazine'. I do have to mention that I was thrilled ! So, the cake was kind of a dual celebration. Pre heat oven to 350 F. Grease cake pans or line it with parchment. I prefer parchment as it is easy to get the cake out. In a bowl mix the hot coffee and coco powder till it dissolves and let it cool. Mix all the dry ingredients except sugar ( all purpose, baking soda, baking powder, pudding mix and salt) If you do not have pudding mix you can increase the sugar by 1/4 cup. (total sugar then being 2 1/4) The original recipe calls for 2 1/4th sugar, I replaced 1/4 sugar with 1/4 pudding mix. I loved the result, the cake was very moist and not too sweet. 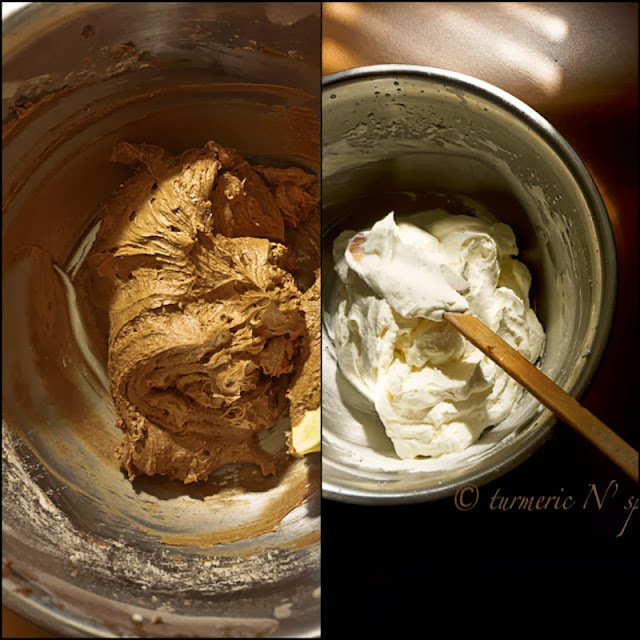 Cream the butter and sugar till light and fluffy, beat in the eggs one at a time, add the vanilla, now add the flour mixture and the coco and coffee liquid alternately a bit by bit, till done. Spread batter in the pan, bake for 30 - 35 min. I used the chocolate butter frosting to cover up the sides, on second thoughts, you do not need that. Cream the butter, add sugar and the rest and cream till a smooth consistency, transfer into pipping bag and refrigerate till you use it, specially in the warm summer months. Recipe from here . Whip cream, sugar, almond extract for 2 min on high speed, add gelatin, whip for another min or till stiff peaks form, refrigerate till you are ready to use. Cut the top of the cake with a serrated knife to give an even top. cut the cake in two equal halves. pour the syrup all around so that it is soaked up by the cake. 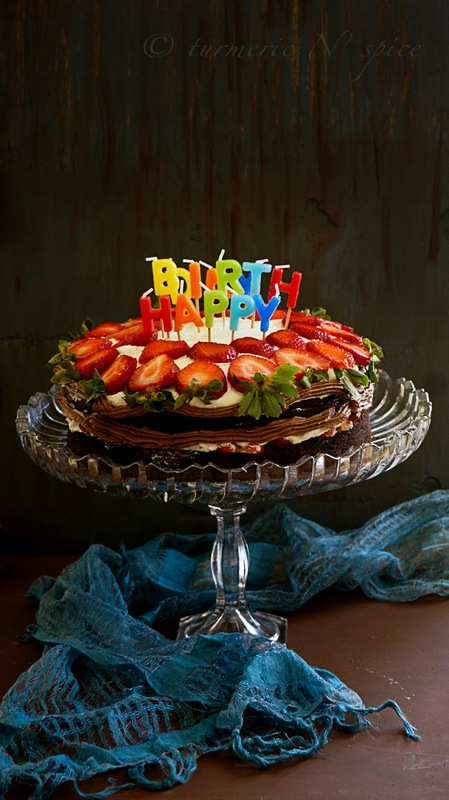 Place strips of parchment around the cake stand and place the lower half of cake on it. The reason why you do this is to keep the cake stand clean, you can just slip off the parchment after you have iced the cake. Generously apply the whipped cream frosting, add a layer of cut strawberries. Now lower the top half of cake on it. Spoon the whipped cream on the top of the cake. Spread evenly. Pipe the butter frosting to the sides so it looks clean. Arrange strawberries slices on the top leaf side facing you, to give a nice rustic look. Serve at a party, or call your friends and have a party! We don't need reason to celebrate. The cake stand was gifted to me by a very good friend for my b'day last year. It's beautiful right! To think,I called you in the midst of this endeavor..the cakes looks delicious & the pics are amazing..
Smita : wish u were close by, so I could have home delivered some to you. Thanks! 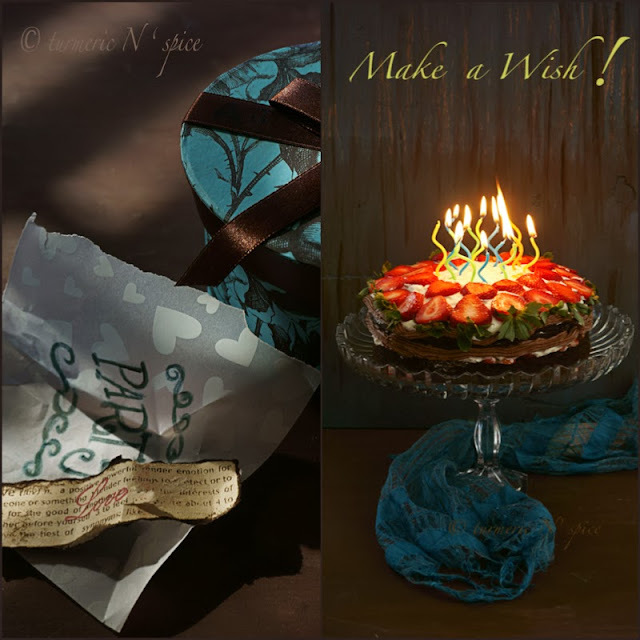 To think of, I called you while you were in the midst of the endeavor..The cake looks delicious & the pics are amazing. Need to learn the art of photography from you..
Am still learning, I just love photography. Well I need to learn time management from you! off to cleaning up the messy kitchen !! I want this cake right now...wow, looks amazing !!! Aweosme clicks.. Lots to learn! :) Perfect is just a word!.. How do I leave a comment on your blog ? I can't find the comment section on the blog. Congrats on the feature, how awesome. The cake looks ridiculously good and delicious looking. 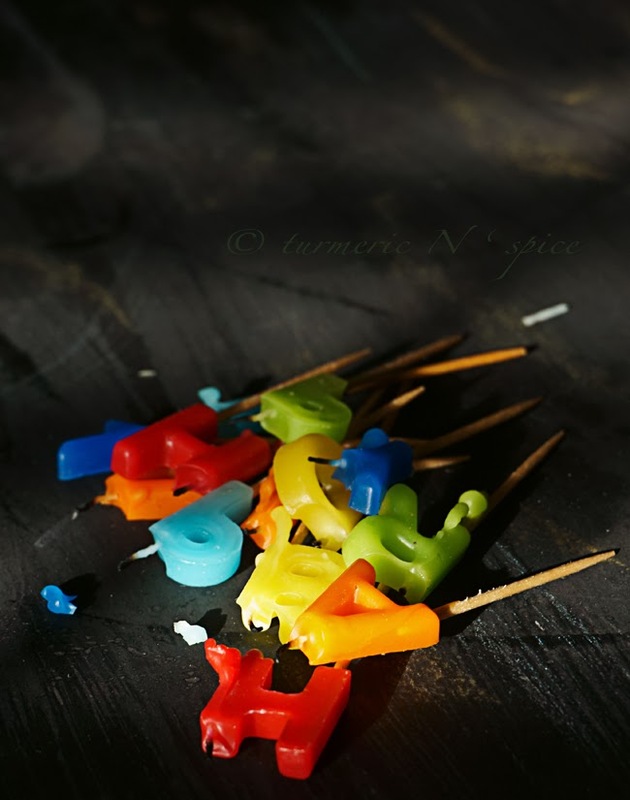 With this post I'm debating if I like your recipes, photography or writing more. I can't seem to decide ! Congratulations on the feature! Your story about homecoming shopping is hilarious and it goes without saying that your cake looks fantastic! OMG this is the awesomest cake I have seen so far ! Looks so beautiful crunchy & deliiiccciiiooouuusss !!!!! Ooh, the cake looks delicious. All that chocolate, yum! This looks very good. Thanks for sharing it. I will have to try it.